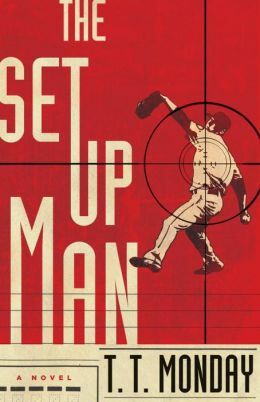 THE SET UP MAN is a fantastic debut crime novel entrenched in the world of Major League Baseball, and the cruel underworld of people trafficking and prostitution. T.T. Monday balances insights into these spheres, crafting a novel that will appeal to both crime fiction aficionados and baseball fans. And if you’re like me, unfamiliar with the game, Monday streamlines the baseball vernacular so that even greenhorns will enjoy the narrative. T.T. Monday introduces aging pitcher Johnny Adcock, who moonlights as a private investigator, discreetly assisting his fellow professional athletes with their personal issues – when a player, coach or agent has a problem they need solved quietly, Addock’s the man they call. In THE SET UP MAN, that problem snowballs into something with life-threatening consequences. The novel boasts plenty of deception and deceit; plot twists abound; and throws plenty of spanners into Addock’s baseball career – there are rumours of a promotion, suggestions he might be traded, all of which play at the back of his mind as he tries to solve the case involving the apparent murder of his teammate, and his involvement in a prostitution ring. Despite the implausibility of the novel’s central conceit – a pro baseball player doubling as a private investigator – Monday’s use of the first-person perspective allows the reader access to Addock’s innermost thoughts. He acknowledges his parallel careers are incongruous, but can’t bring himself to quit either; he’s failed at being a husband once, and ponders the repercussions of a second attempt. The question, of course, is how can Monday return to the character without treading over familiar ground? Whatever – – that’s a question for another time. Just take my word for it innovative and fresh, THE SET UP MAN was a nice surprise in my reading pile, and it’s something I highly recommend adding to your own. You can read an interview with T.T. Monday on TheReadingRoom blog.